A walking tour exploring the history & architecture of the West 60s & 70s. In recent years, New York City has undergone an era of redevelopment unseen since the days of Robert Moses over a half century ago. 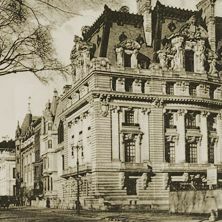 Our Upper West Side tour ties together the opulent architecture, scandalous social history, and progressive religious and class reform of this historic and ever-evolving neighborhood. Stops could include: the Dakota, Lincoln Center, The American Museum of Natural History, The Ansonia, and stops associated with Florence Mills, Mae West, Robert Moses, James Dean, The New York Dolls, and the Charleston. NE corner of 66th Street & Columbus Avenue, in front of ABC Studios, 77 West 66th Street. Train: 1 train to 66th/Lincoln Center.